Training to power: An overview for triathletes. With the improvements and advancing technology in the cycling world, power meters are fast becoming a mainstream addition to a serious triathletes machine. The benefits of training and racing to power are very applicable to cycling in triathlon, particularly long distance events. Over this three part blog we will look at the features; benefits; options and application of Power into your training and racing plan. A power meter is able to provide you with instant feedback about the amount of physical effort you are exerting to move your bike. Power is measured in Watts and is a measurement of the force exerted from your legs to your bike’s drivetrain per second. Power is able to show you how hard you are working at that point in time – the higher your power output is (in relation to your power zones), the harder in general you are working. When compared to heart rate, power readings are instant whilst heart rate is lagged and responds to the demands of that exertion. This allows power to be a more sensitive and responsive tool when riding a bike compared to heart rate. Consider a stretch of road with some hills and different surfaces. 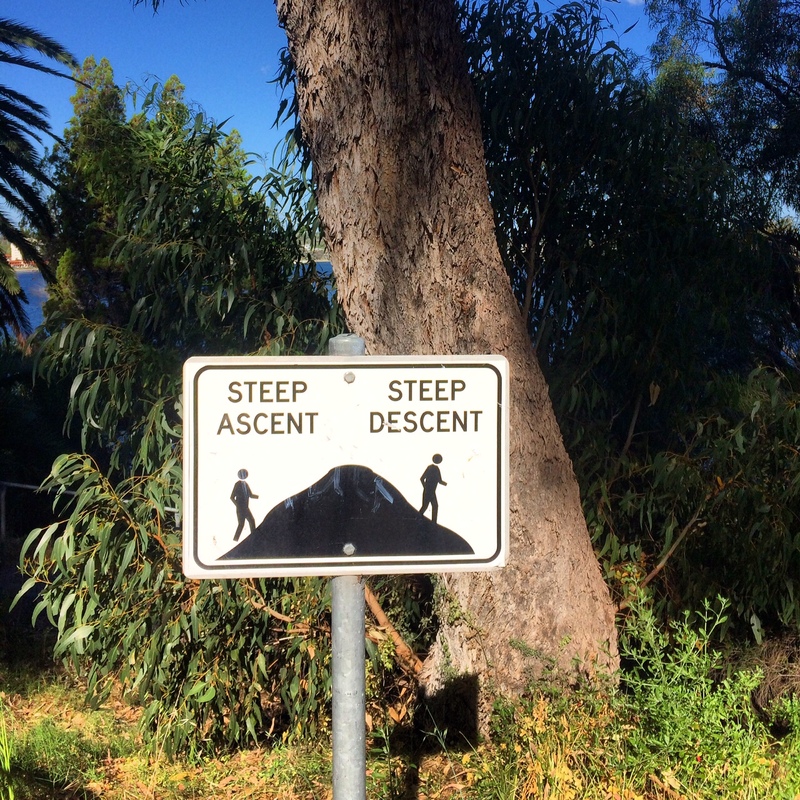 It will be easier to pedal downhill and over smooth surfaces than uphill and over rough surfaces. A power meter will tell you how much power you are putting through to the bike in each case, whereas the heart rate will be slower to adjust as your cardiovascular system reacts to the demands of the course. The effects of aerodynamics and friction are so much more significant in cycling than in running and bike courses are so varied that power output required to maintain a certain speed will vary so much throughout a bike course. 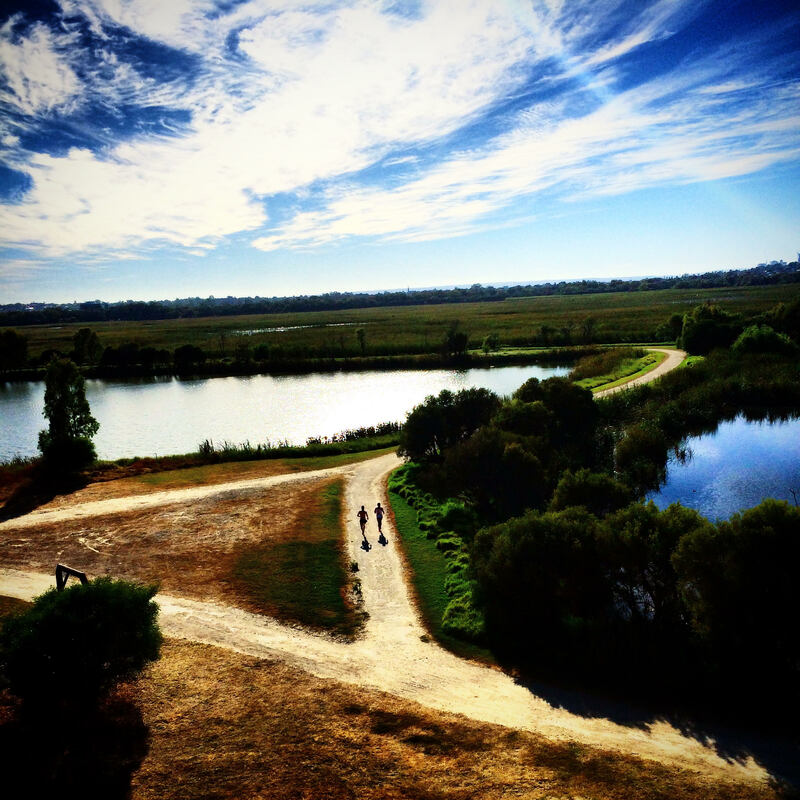 Consider the Busselton Ironman bike course – there are smooth patches of road, rough patches, sections of head and tail wind as well as slight inclines and declines. When riding through each of these areas, an athlete riding without power will find their target heart rate drift as well as their speed varying greatly. An athlete riding to power will simply ride to their target power zone the entire time. 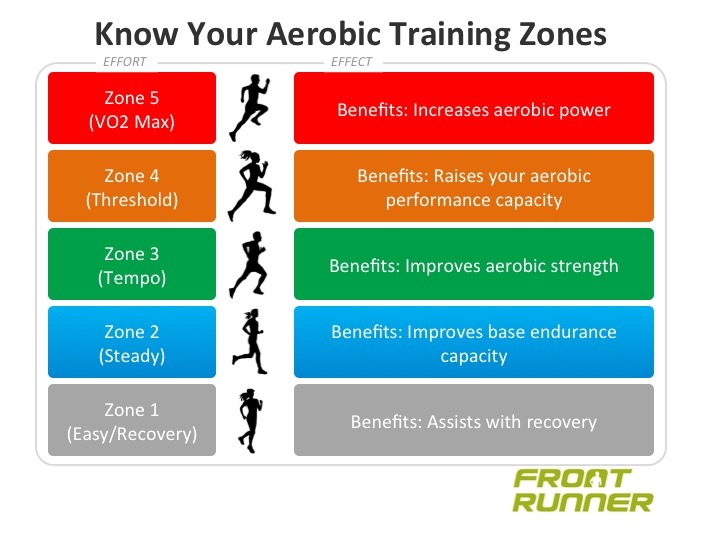 Just like heart rate zones, an athlete can train to power zones to improve their performance. Threshold power can be determined just like running critical velocity or threshold heart rate can. From here, an athlete can then know what power zones they need to ride in to get the most optimal training and in term maximise their race performance. On race day the benefits are similar as an athlete knows what power zone they need to ride to throughout the race. The benefit of power meters in triathlon is huge, and on race day power readings are arguably more beneficial to all triathletes than cyclists in a road race. This is because so much of a triathlete’s training and racing is done as individual efforts compared to road cycling where much almost racing is in groups. If you are able to know how hard to ride by yourself you will be in the best position possible complete the bike leg at an optimum level. In doing this, your run and therefore your overall race result will also benefit. In part 2 Tom will talk about types of Power Meters and pro’s and con’s of each type……. Firstly, to understand our threshold (AT), we need to understand how the body uses energy when we run. Aerobic energy is simply energy that is derived from oxygen (O2). When we run, our body is breathing in O2 from the environment and taking it to working muscles via the lungs and bloodstream. The muscles then use this O2 for energy and put out carbon dioxide (CO2) as a waste product that we can then breath out. This is a very sustainable activity as there is plenty of O2 to breath in and the body has an effective method of expelling the CO2. As our exercise intensity, and subsequent demand for energy, increases, the body will continue this cycle of breathing in O2 and breathing out CO2. If we keep increasing our exercise intensity (running faster) then eventually there is a point when the body can no longer supply the energy required through O2 alone. This is where the anaerobic energy system comes in. As your O2 demand approaches its maximum capacity, the body will begin to supply energy through anaerobic sources (the details of which are beyond the scope of this blog). The advantage of anaerobic energy is that it can be supplied to the body extremely quickly, essentially topping up the energy demand that cannot be supplied by O2. The disadvantage is that the waste product of anaerobic energy, hydrogen ions (H+), cannot be dispelled as easily as CO2 (the waste product of aerobic energy). When we use anaerobic energy, lactic acid is the initial waste product that immediately breaks down into lactate and H+. The H+ are our primary concern as when they accumulate, they create an acidic (low pH) environment in both the working muscles and the bloodstream. When the pH drops significantly, muscle function is impaired and performance is compromised. Anyone who has tried to run near their best pace for more than 30s will know the feeling! Now, without getting too complicated, a key point to understand is that to clear the H+, we need to combine them with O2. But remember we are already using all our O2 to fuel our aerobic energy. So until we reduce the intensity of our run to a point at which there is now O2 to spare, we will continue accumulating H+ and our pace will not be sustainable. Our AT can now be defined as the point at which H+ are being produced in the muscle at the same rate at which they were being cleared into the blood. If we begin accumulating H+, we are above our anaerobic threshold. For runners of all levels, improving their AT is a significant predictor to distance running performance. For runners targeting distance events (>3000m) almost all of the gains in performance will derive from improving the capacity or efficiency of the aerobic system. To justify this, we must remember the proportions at which each energy system contributes to our running. If we run at our best pace for 45s, we derive ~50% of the energy from both aerobic and anaerobic sources. Going up to 2min sees us use 65% aerobic/35% anaerobic and 4min will see us use 80% aerobic/20% anaerobic. So with the time it takes to run events of 5km, 10km, 21km or 42km, our primary concerns for increasing performance lies with our aerobic system. Remember our AT is the point at which we go from being sustainable with our aerobic energy demands, to unsustainable. So if we can raise our AT (run at a faster pace for the same H+ production) our aerobic performance ceiling is increased and our distance running performance can improve significantly. Once you have a pace or HR that correlates with your AT, we can set about training to improve it! We know that the most effective way to improve our AT is to train on or slightly beneath our AT, not above it. As the body does not like an acidic environment, regularly going close to the point of H+ accumulation (but not over it) gives the body the stimulus it needs to enhance the aerobic capacity within the muscles (again, the specifics of which are beyond the scope of this blog) to improve the capacity at which O2 can be used as a fuel source. How long you can spend at your AT is a reflection of your current conditioning to AT training as well as your muscular endurance. However, most regular runners should find that in training, they should be able to run for ~20min (either continuous or in long intervals) at their AT when working reasonably hard. To continue to improve your AT, we need to gradually increase the amount of time we spend running at your AT. This could be achieved by having less recovery between AT intervals or spending more time at your AT. But importantly, you should not run quicker than your AT, as we lose the aerobic stimulus required to get maximum aerobic adaptation. Secondly, a more active and shorter recovery. Typically threshold intervals should be separated by 90s – 3min of active recovery, depending on your current level of conditioning to the training. If you find you need more recovery, you will likely be exceeding your AT pace. 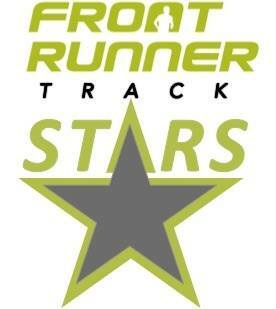 As you train more regularly at your AT, you will find your time to recover and feel comfortable again will reduce. So initially take less time (e.g. from 3min to 2min to 90s) then try to make the recovery more active (e.g. from a walk to a light jog, to a steady jog). 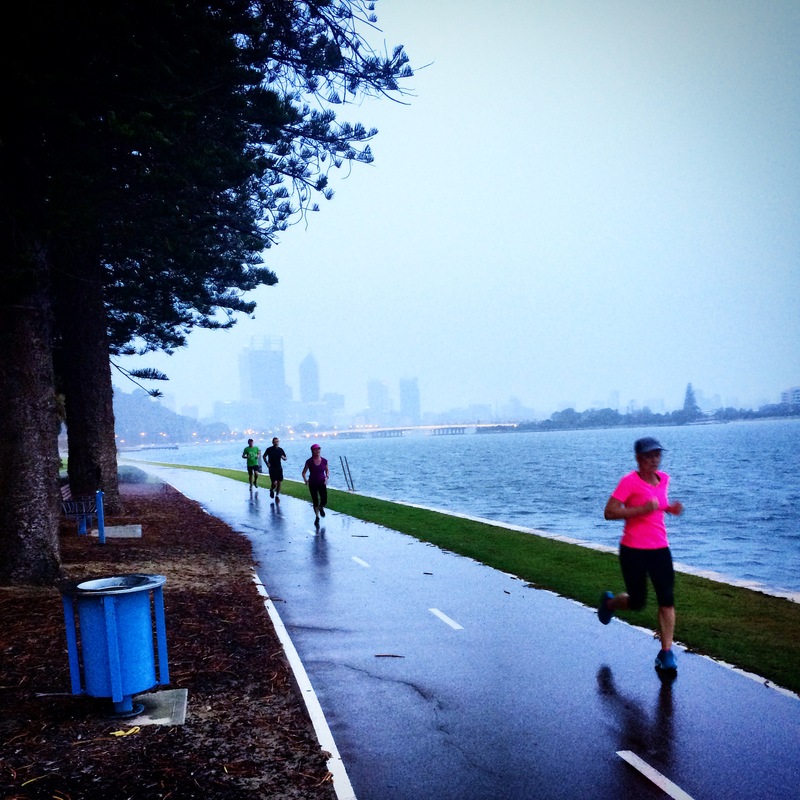 As the winter months approach, many runners set their goals and targets for the upcoming season of fun runs. A target race or event can provide a fantastic end point for a training process and can fill the runner with initial motivation. 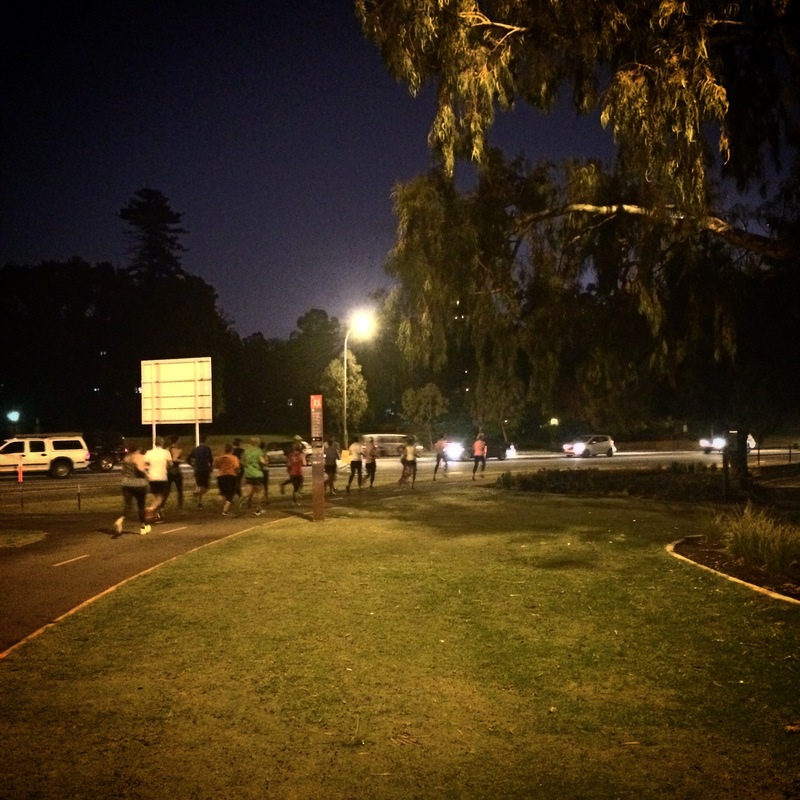 Where many runners (from beginners building up to their first fun run, right through to elite runners looking to run their best time) will often come undone, is the patch of training that occurs after this initial motivation. The buzz and excitement of entering the event has passed and the event itself is too far away to get excited about. So how can you encourage consistency in your training to ensure you give yourself the best chance of achieving your goal on race day? One term that is commonly associated with successful people, whether in running or otherwise, is mental toughness. What is mental toughness and how can you apply this to your own training to maximize your own success in running? A common definition of mental toughness reads “A personal capacity to deliver high performance on a regular basis, despite varying degrees of situational demands”. Now I’m sure everyone can relate to this, where they have had the initial motivation to perform a task when the thought arises in their head, before certain circumstances (weather, work, traffic, sickness etc.) limit their capacity to perform the task as they want to and therefore don’t attempt the task at all. Now obviously some circumstances are beyond our control and part of being mentally tough is accepting that. However, what we must learn from this definition is that if we want to be mentally tough, we must focus on our behavior and not our thoughts. I recently attended a talk from a well renowned sports psychologist from UWA who discussed this very idea of focusing on mentally tough behaviors. His summary was that if an athlete is frequently delivering high personal performance, then it is as much a reflection on their behavior as it is on their skills. Therefore, his advice to athletes who are seeking their own levels of high performance was to make sure you behave in a mentally tough way and to not just think in that way. Backing up day to day and week to week, regardless of the circumstances is the key to demonstrating mentally tough behaviors and will be the cornerstone to your success in your own goals for your running. On a closing note, how do you know if you’re being mentally tough… quite simply someone will tell you! To quote to famous AFL Coach John Kennedy… don’t think, DO! 8 factors to consider when picking your next Marathon……. Your training has been perfect, over many months you have built your fitness to your best level ever and you are excited to chase a PB and travel to one of the worlds great marathons. You jump on a plane Wednesday before the race, travel 24 hr though two flight changes, arriving in Europe ready to beat your best that weekend. A few days of new food, mild jetlag and some sightseeing later and race day is here. On race day you start well but towards the latter stages you feel a little off your best and you finish steady but in a time is a few minutes off from your best and little away from your goals…..
Having coached many marathon runners towards their target races over the past 7 years, this has become a clear and consistent pattern for runners travelling to big European and American races. Strong performances are the norm but rarely are they great races. By tracking these patterns we start to be able to identify the cause of these trends and help our athletes better choose the appropriate racing location and timing to achieve their goals. We also start to be able to develop better preparation strategies, both physical and mental, to increase the likelihood of goal attainment in the case of races in Europe and America. Kids Running – How should we train our kids to run? Running is a fundamental, locomotor skill and its development is crucial to be able to participate in many sports and activities. Many parents worry their children exhibit undeveloped running styles compared to their peers and fear this may hinder their ability to compete and engage in sporting activities. Extensive research into running tells us that children respond differently to adults when exposed to running training and that more emphasis on good running fundamentals and technique may be the key to developing good runners. Think back to when your football coach made you run laps as a young kid with the aim of making you fitter for the upcoming season. Although the intentions were good, the process may require a little rejigging. It is widely accepted in running literature that children do not respond the same way adults do to running training on a physiological level. A simple example of this is if you take an inexperienced child and an inexperienced adult runner and make them run 2-3 times a week for say a month. The improvements seen in the adult in terms of running performance will far outweigh that of the child. This can largely be put down to physiology i.e. the child’s energy, cardiorespitatory and musculoskeletal systems are not developed to the level of adults and therefore wont be able to take full advantage of the training. So how else can be train running performance in kids? The answer lies in technique! If you want your child to be able to swim then you would send them to swim classes were they would experience a mix of swimming technique drills, swimming laps and of some fun and games. So why is running so different? Why would the same approach not apply to learning to run? The answer is that it should. In 2014 I was apart of a research study which looked to identify if known “good” running biomechanics variables in adults were comparable in children and if good running biomechanics in kids meant better running performance in kids. The answer was an overwhelming yes! The top performing prepubescent runners (6-12years of age) exhibited the best running biomechanical variables of the cohort. I’m not suggesting that purely running technique or biomechanics will allow you to become a good runner but they certainly form a much larger piece of the pie then most of us would think. So to allow your child to have the best chance at becoming the best runner they can the key is a mix between running for fitness, technique fundamentals and of course fun and enjoyment! The right balance of all of these components helps form the basis of our trackstars development programs aimed at giving kids of different running backgrounds the ability to achieve the most out of their running. The key is also to start young. As anyone who has only started running technique drills in their adult life can attest to (myself included here), the saying you can’t teach an old dog new tricks does hold some truth! The knee is the most commonly injured area of the body for runners. This is surprising given its actual workload in normal, healthy runners. Ben often quotes his 50-18-32% split for the muscles working around the ankle, knee and hip joints respectively, so why is the knee always a point of injury if it does so little work? The knee is built to be a flexible transfer joint. It transfers forces up and down the chain and allows functional limb shortening/lengthening for swing and stance phases of running gait. When either the ankle or hip have problems holding up their specific requirements, excess force is transferred to the piggy in the middle… the knee. Rotational forces are a large contributor to disruption at the knee joint – either lack of hip external rotator strength (yes glutes, glutes, GLUTES!) or over-pronation in the foot both lead to internal rotation moments at the knee. 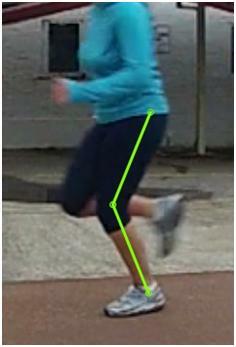 The above runner is collapsing down into 55o knee flexion in the image on the right but only 45o on the left (better!). The more you collapse down into the leg, the more you are compressing the “spring” of the lower biomechanical chain. As the knee is a key component in transferring energy/load up and down that chain it experiences greater loading (just like going lower for a walking lunges strength exercise). From our Technique Course participants we have found the below averages for knee flexion in mid stace… aka “Knee collapse”. A meta analysis of the literature of the time (1997), performed by Tom Novacheck revealed an average knee flexion angle in midstance of 45 degrees for people “jogging” and this angle became less when participants ran at higher speeds, as ground contact time reduced. Our data mirrors that literature review quite closely. 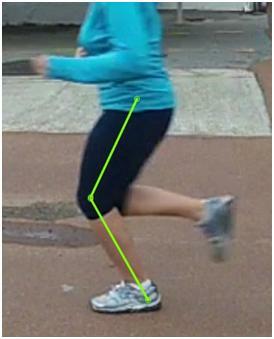 The peak knee flexion angle can be a very good predictor of Runner’s knee. 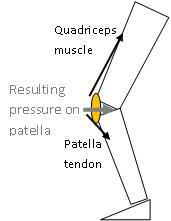 The Quadriceps muscle pulls the patella upwards and the patella tendon keeps if firmly tethered below, as you fall into more knee flexion the resultant force vector applied to the patella is retrograde (pulling the patella firm into its joint). The mild extra pressure leads to tissue breakdown and injury after multiple steps, kilometres, runs… a true overuse injury. From a performance perspective the “spring” analogy of the lower leg is an appropriate one. A stiffer spring will give back a greater percentage of the energy that is stored in it when released. A stiffer lower leg through the “musculo-tendinous” (muscles and tendons, NOT bone) units will allow for a better running economy. Also, with less knee-bend comes less vertical change in the centre of mass. Less up and down motion means less energy is needed to work against gravity and more can be utilised to move FORWARDS, the most useful direction when running. A Finnish study by Leskinen et al. in 2009 demonstrated that elite 1500m runners exhibited less peak knee flexion than national-level athletes when running at very similar speeds in a race (2min, 33sec kilometre pace compared to 2min, 36 sec pace). The elite runners are better at storing the energy in their patella tendons, just as with the Achilles, during stance and unleashing it in the propulsive phase of push off. The stiffer spring/less knee collapse allows for better elastic energy storage and thus performance. In long distance running we all end up at a point where we feel as if we are running down INTO the ground, instead of flowing over it. It is at this point we are becoming inefficient and putting extra load through our connective tissue, especially the knee joint. Gluteal, quad and calf strengthening (all the extensor muscles) are needed to prepare the body to run longer and stronger than it currently can. Knee injuries are one of the most common. If you are excessively collapsing down into the hinge joint in the middle of your kinetic chain seek help. The causative factor may not be in that exact area though. If you have an issue in your knee tissue… trust the experts.